Our research, which made front page of The Mirror, revealed that bus firm shareholders are pocketing £149 million of your money every year on average. New polls that came out yesterday show that 72% of bus workers believed their company prioritised making a profit over providing a service, with 84% of bus workers saying they believed bus services should be publicly owned and operated. It’s clear to see: deregulated networks are delivering worse services to less of us, while making big profit margins and giving shocking shareholder pay-outs. The best news is that we have an opportunity to change this now. Because of legislation passed last year elected Mayors such as Greater Manchester’s Mayor Andy Burnham have the power to regulate buses. Greater Manchester’s Andy Burnham is making the decision very soon about whether to bring buses into public control. He could end the wild west we have currently in Greater Manchester and set a lead for all the UK to follow. This is why We Own It set up the new campaign: Better Buses for Greater Manchester calling for better, publicly controlled bus services. While bus use across the UK excluding London has fallen to a twelve-year low, fares have increased by 55% in the last ten years. This when shareholders of the big five have received £1.49 billion of dividends in the last ten years. This is an absolute minimum, as it only includes the major bus operators, not the smaller operators! Ask Andy to stick to his word and regulate the buses now. Regulating a network means that one body, the local authority, has oversight of it. Local authorities decide the timetables, fares, pensions of drivers, maximum emissions that buses give out, and more. They can use profits to subsidise socially necessary services, preventing a profit driven, skeleton network where only money maker routes are run. A regulated, or 'franchised', bus network is how it's done in London, and most places across the world. 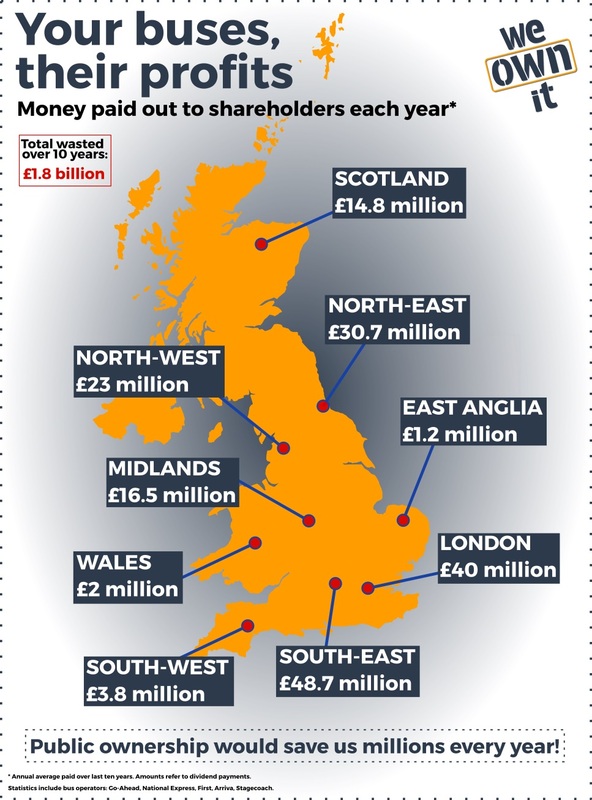 In the North West, an average of £18.4 million is going to shareholder pay outs every year. All this while in urban areas such as in Greater Manchester, bus journeys have fallen by 40% since deregulation. Fellow bus user Sandra Dutson from Eccles doesn't have a car and has no option but to get the bus. She said: "One dark, wet and cold evening recently after a rather long day of travelling when I was longing to be home and having hot meal, I was standing at a bus stop for around 45 minutes. In that time there should have been two buses at least to my destination." London has a regulated bus network, where Transport for London (accountable to the Mayor) runs the buses, and they have one of the best bus networks in the world. Clean, reliable, frequent, and affordable. Jersey does too, and in the last five years alone Jersey’s regulated bus network has seen as 32% increase in passengers. All this while Greater Manchester has lost 8 million miles of bus route since 2010. Doesn’t Greater Manchester and all the UK deserve a world class bus network? Don’t’ we need one, with rising congestion, air pollution and climate chaos already causing havoc and bad health? Greater Manchester is one of the first combined authorities to investigate franchising. It could lead the way for the rest of the UK to take buses under public control. The same bus services bill which makes regulation of the buses possible also made new municipally owned bus companies illegal. Public control of our buses is on the table right now however. Buses are lifelines for communities, they take cars off our roads and make the UK a better place to live. This is about transport justice and creating a bus network that is reliable and accountable to us. We cannot go on as we are now, with bus companies in the driving seat. We need public control to get better buses. If you believe buses are important to achieving vibrant, liveable places in the UK, with belonging at their centre, please join the call for better buses. Now's our chance to massively improve buses! Whether you’re a solidarity signer or a Mancunian, please sign the petition now. The privatisation of our public services is a scandal and they should all be brought back into public ownership. Taxpayers are losing millions if not billions every year to useless privatised companies and their shareholder! Try the 155 run by Arriva from Maidstone to Chatham...rubbish service as with most privatised services. They don’t care about customers, the business is run for the shareholders. This is becoming a highly pressing issue, especially in Rawdon, Leeds, where pollution can be over the legal limit. Why run buses for people rather than profit?